If you have taken yoga or have had a hot stone massage or an energy balance treatment, you have probably heard the term "chakra." Several religions, holistic healers and others believe that the body has energy centers which are known as chakras. Chakra in Sanskrit means "wheel" as it is also believed that these energy centers, if one could actually see them, would look like spinning wheels or a vortex that moves in a circular motion, forming a vacuum in the center that draws in anything within its environment and also allows energy to flow from one part of the body to another. The energy and vibrations that chakras draw from our surroundings can be positive or negative, such as another person’s aura. Therefore our environment and the people who are in contact with us have an effect on our chakras and therefore our energy and health. Have you ever been in the presence of someone and their energy just makes you feel great and brightens up your day? They might not even have said a word to you. They just simply glow. Or have you felt a "negative vibe" from someone and just being around them makes you tired or agitated? It is believed that we have numerous chakras within our body, but the focus tends to be on seven main chakra centers that are aligned along the spinal column. Each chakra corresponds to an organ or gland, aspects of the psyche and is also believed to resonate with a specific color vibration and sound frequency. First Chakra (also known as) Root/Base Chakra (Red) Base of the spine. Second Chakra - Spleen (Orange) Lower abdomen to the navel. Third Chakra - Solar Plexus (Yellow) Above the navel and stomach area. Fourth Chakra - Heart (Green) Center of the chest. Seventh Chakra - Crown (Violet) Top of the head. When one or more chakra centers are out of balance, (often referred to as blockages) we can experience it at a mental, emotional or physical level--depression, sadness, stress, headache, etc. In energy work, which can be found in a variety of modalities such as energy balance massage, a therapist can sometimes find these imbalances before they manifest themselves in physical, emotional or mental illness. With the use of healing aids such as essential oils, crystals and sound healing, the therapist works to restore these imbalances so that energy within the body can flow freely and restore overall physical, mental and spiritual health. 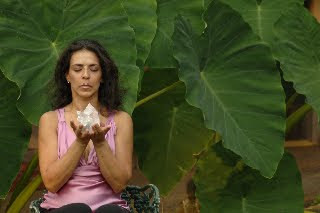 There are several healing aids used in energy balance treatments such as the Arkansas quartz crystals used in the Crystal Energy Balancing Therapy treatment at the Turtle Cove Spa. The number of energy balance treatments being offered at spas has increased quite a bit since 2006 when I had one such treatment at a resort in St. Lucia. After that experience I began to realize that there was something to this. Energy balance massage was originated by therapist/chiropractor Mark Brown, a founding member of the Australian Holistic Healers Association. This process of massage works on the principle of moving blocks of stagnant energy in the body. These blocks of stagnant energy are believed to be associated with physical, mental or emotional problems or imbalance. Energy balance treatments are designed to clear these blockages and enhance the body’s own natural healing energy. There are many variations of energy balance treatments as well as different methods in which to achieve balance, such as the use of crystals, hot stones, tuning forks and sound vibration. The massage therapist determines where the imbalance or blocks are occurring within the body and aims to unblock the client’s chakras (energy centers) through massaging the points on the body that align with certain energy fields. As energy in the body is released and reintegrated, clients have been known to experience emotional or physical pain relief and increased energy. Many recount certain sensations, involuntary reactions such as twitching, warm rushes and tingling. Still others have reported experiencing visual acuity in which colors appear brighter and objects seem to have increased clarity, or feelings of centeredness and heightened awareness similar to what one achieves through deep meditation. The effects are unique to each individual. My experience added a new phenomenon to the list: I had the sensation of floating above the massage table, and, with eyes closed, visualized myself flying high above the vivid green valley between the Pitons. Read more here. I started writing about travel some thirteen years ago and now it is rare when I take a simple vacation. When this year’s family reunion was held at National Harbor in Maryland, I thought "What a nice location for a reunion" and "Wonder if I can get a story out of this?" Even though my fifth finger (my pen) and the white matter (the "paper brain" known as a notepad) weren’t out, the words were still forming in my head. 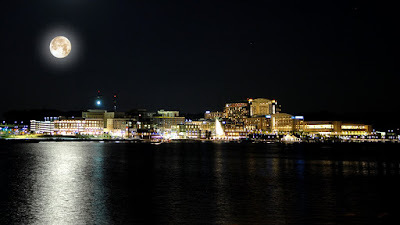 National Harbor had controversial beginnings ranging from public complaints that the project would create a negative environmental impact to claims that it would ruin a heritage trail that has been in the works for years, yet there it stands–a 300-acre development that is marketed as a destination for shopping, dining and entertainment with the Potomac as an attractive backdrop. I was impressed. I didn’t step foot in any of the boutiques (too pricey I was warned), not even my favorite Life Is Good store. The dining options range from classic American cuisine at Ketchup, Mexican at Rosa Mexicano to the pseudo-healthy-depends-on-what-you-eat Elevation Burger. Elevation Burger serves beef that is from organically raised, grass-fed, free-range cows and french fries are cooked in olive oil (Didn't I read that you shouldn’t use olive oil for frying?) There are also veggie burgers, and I know at least one person who probably wouldn’t appreciate the Vertigo Burger and not just because you can build your own 3-10 patty burger. Actually the thought of that is dizzying. Not to fear, there’s also a Half the Guilt burger. I wandered with my cousins into Grace’s Mandarin for Asian Fusion cuisine and a nice Strawberry Mojito. Though our food arrived in a timely manner at Grace’s Mandarin, many of the restaurants have appallingly slow service. For entertainment there’s a sunset concert series on Thursdays (May-August), Friday night jazz on the waterfront (and it was packed), Movie on the Potomac–free movies after sunset on the Plaza’s big screen. You bring your own lawn chairs, but coolers with food and/or booze are not allowed. If you want to take in more sites than the Harbor has to offer, there are water taxis to Alexandria, Georgetown and George Washington’s Mount Vernon. A few of us took a $35 taxi ride to Washington, D.C. to the National Mall, the mile-long strip of free museums (known collectively as the Smithsonian). 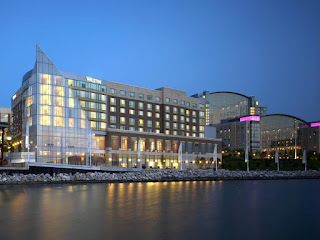 Currently there are six hotels, including the 195-room Westin National Harbor where we stayed. The Walt Disney Company is going to build a new resort here as well. If you travel to the area by plane, transportation to the National Harbor can be a challenge without a rental. There are no direct routes between the airports and the National Harbor, so the Washington Metro area transit is not recommended. You’ll have to rely on SuperShuttle (which will stop at all the hotels at the waterfront), taxi or car service. A rental seems the way to go when you get to the harbor as well. If you need incidentals, a bottle of wine, inexpensive snacks, you really need a rented car or you’ll have to take a cab to the nearest mall with a CVS and liquor store–trust me, you won’t be able to get there by foot. As for parking, I noticed meters on the streets and a municipal parking lot (which you’ll probably prefer to hotel parking–the Westin’s price was pretty high). Those minor problems aside, National Harbor provides a great weekend getaway and if you're visiting the Washington D.C. metro area, it's definitely worth a visit.